255 N. PHOENIXVILLE PIKE, MALVERN, PA 7:30 p.m.
Andre von Hoyer, Chairman (arrived at 7:40 p.m.), Michael Richter, Vice Chairman, Wendy Leland, Andy Motel, Matt Rogers, Bill Westhafer, and Dan Walker. Michael Churchill was absent. Mr. Westhafer announced that Earth Day is April 6th. Ms. Leland said the latest copy of the magazine Mainline Today features an article on Sue Staas, who recently moved to Hershey Mill. Ms. Leland attended a symposium on security in the worship place. While there, she received a map of Chester County’s pipelines which she distributed to Members at our meeting. Mr. Motel will be walking around Brightside Farm Trail on Thursday, March 14th to find locations for bird houses. He will be installing the bird houses on Earth Day and invited all to join him. Ms. Leland moved to approve the edited minutes of February 26, 2019, and Mr. Motel seconded. Mr. von Hoyer called for discussion, and, there being none, called for a vote. All were in favor. Mr. and Mrs. David Saunders were present to discuss their proposed single-family home at 14 Aldham Road. The garage for the home would encroach on the side yard setback due to constraints on the property involving steep and very steep slopes. An older existing home, which is located further into this setback, would be demolished. Mr. Wright suggested they come to the Planning Commission for feedback prior to filing an application to the Zoning Hearing Board for relief. The home is 168 sq. ft. over the setback line because (1) of the garage placement and (2) the placement of the home to maximize the view. Ms. Saunders provided Members with a packet which included a proposal plot map without the variance, a map with the requested variance, pictures of the home they had designed, and photos of the site. House would be farther from steep slope. Boulder wall (estimates at $20,000+) would not be needed. Shorter driveway would save 600 sq. ft. of impervious surface. House would be slightly farther away from nearest neighbor. There would be a smaller area of disturbance. There would be a shorter distance to septic field. Placement with variance would not negatively affect neighboring properties. The hardships that were most notable to Ms. Saunders were the $20,000-$50,000 boulder wall needed without the variance, and the presence of a steep slope so close to the house. If the design can fit within the setbacks of the site. If the design was completed outside the building envelope. Mr. Rogers also clarified Mr. Wright’s review letter, “that because of such physical circumstances or conditions, there is no possibility that the property can be developed in strict conformity with the provision of this chapter and that the authorization of a variance is therefore necessary to enable the reasonable use of the property”. The Saunders were informed that since they could build it without a variance, there is no hardship. They were also told that since the slope is more that 25%, a Conditional Use is not an avenue for this home either. Mr. Motel also stated that disturbing Very Steep Slope will not work with this particular home design. Rotate slightly the home within the building setbacks. Mr. Comitta suggested contacting Mr. Tim Townes if they did find themselves needing to build the boulder wall. Mr. Townes is the developer of Pickering Crossing and he has many boulders. There was a work session in January with the Solicitor, Supervisors Philips and Kuhn, the Township Engineer, and Mr. Comitta. Mr. Comitta stated that he is nearing completion of the additional edits and amendments pertaining to Conditional Uses as well as related Standards & Criteria. He said he met again with Mr. Thompson last week for additional input and wants to provide a brief update to the Planning Commission. First, all Definitions will be moved to the front. Secondly, Mr. Comitta referenced Item E on page 1 of the handout entitled Charleston Township-Considerations for Additional Conditional Uses. Item E, the key change being considered, places the burden on the applicant, to provide a Narrative Report as mentioned in the first paragraph of the same page. Many Uses were discussed in light of the zoning changes. Helistop – Mr. Comitta felt this was important, even though there was no real land in Charlestown where it would apply. Typically, these cannot be within one mile of a noise sensitive land use. Restaurant, Fast Food – Members discussed drive-thru vs. take-out vs. fast food definitions, hours of operation, district vs Turnpike ramp traffic, etc. Short-term Lodging – Mr. Comitta felt that this was one of the most important categories and suggested the lodging be owner-occupied. Also discussed were permitting, licensing, inspection, enforcement and liability. Self-Storage Facility - the most popular request for Township space. Ms. Leland suggested the Phoenixville Regional Plan may protect the Township enough to not require a clause that references the permissibility of Uses not mentioned in the Zoning Ordinance. More discussion followed regarding allowing a Conditional Use or not addressing it at all. Mr. Rodgers stated that allowing a path, although it may be arduous, still gives an opportunity. Mr. Comitta stated that the Solicitor suggested the Members stay within probable Uses then track other Uses to review when necessary. There will be another subcommittee meeting soon. The Members will receive packets for review from this meeting that will summarize where the changes stand since the initial attempt on April 4, 2018. At the next PC Meeting, Members will have the opportunity to comment on the suggested changes. Mr. Comitta said to consider if the Use be accommodated, and if yes, to what point it should be properly regulated. If it will not be accommodated, does it still need to be considered for regulation? Mr. Paltry asked for the signature of Mr. von Hoyer for a Sewage Facilities Planning Module for a historic house and barn subdivision. The property is located on Howell Road. Mr. Wright had found it acceptable for approval by Mr. von Hoyer. Mrs. Csete circulated the draft agenda for the March 23rd Strategic Planning Session and asked if anyone had additional topics for addition. For the 2020 Strategic Planning Session, Mr. Comitta suggested one of the topics be Heritage Landscapes. The guidelines for the allowances are found in section 605 (2)(vii) of the Municipal Planning Code. It provides overlay districts for historical, agricultural, and other places with special uses, and a character, surrounding places such as the middle Pickering Historic District. It is based on mapping and designation, and will be useful for protecting Charlestown Township. Mr. Comitta will work on Conditional Uses. Mr. von Hoyer asked for status of the payment by Mr. Townes for the parking revision design at PJ Whelihan’s. Mrs. Csete confirmed the payment. Mr. von Hoyer briefly discussed the following topics with Mrs. Csete. Members briefly discussed other Uses to consider when drafting standards and criteria. Mr. von Hoyer discussed the statement “if it is not included it is not permitted” vs. the language in the IOB section of the Ordinance- “any other lawful use not provided for in any other district”. The Uses to be considered next are rental properties posted by owners on websites (such as Airbnb’s), contractor’s yards, helicopter pads, and self-contained RV visit and stay network members such as HarvestHosts.com, etc. Any documents referred to in the minutes are available to the public upon request to the Township office. 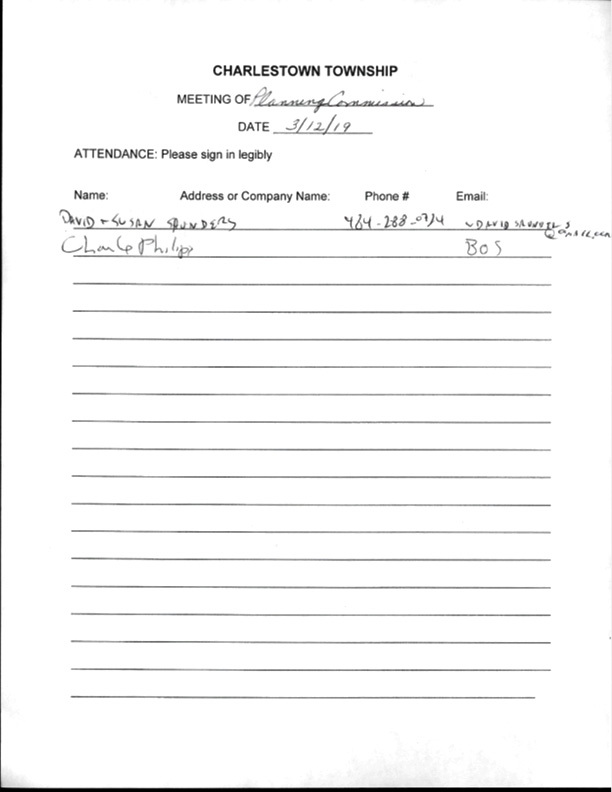 There being no further business, Mr. von Hoyer adjourned the meeting at 9:20 p.m.